This article is for the 4★ , Scáthach. For the 5★ , see Scáthach; for the 5★ , see Scáthach-Skadi. Obtained by completing the Chaldea Summer Memory and Chaldea Heat Odyssey events. Overcharge: Low chance to inflict Death. 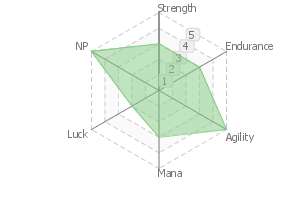 Increase Quick Card performance of all allies by 15% while she is on the field. 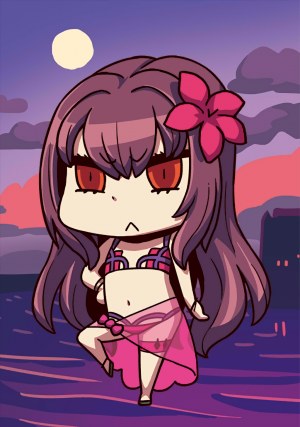 The queen of the Land of Shadows, Scáthach, the mentor of heroes... that is who we are dealing with, but this time Scáthach and several others are taking the opportunity to change into swimsuits with the excuse that it is appropriate for the setting. As you can see, it feels like summer. Scáthach says she doesn't mind doing something like this once in a while. The rune bracelet around her wrist is specialized for the ocean and water. 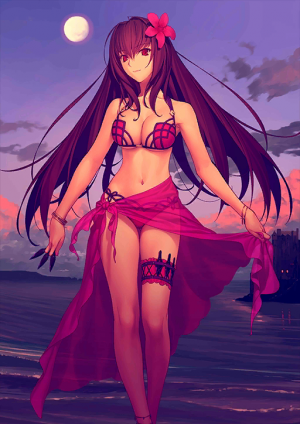 You would think she is no different than the usual Scáthach, but given that she is at the beach, she got a bit more excited than usual. While there is no obvious difference, one should be able to notice if they observe with care. A skill that demonstrates how much attention she can get at the beach. Different from Beach Flower, the skill manages to get people to gaze at her with deep yearning. There is a danger than Scáthach will plunge the beach into chaos just by walking down to it. "Since we're at the beach already, we should have fun." This is Assassin Scáthach's basic point of view. Even toward her Master, she believes they should have fun as much as they can. Soaring Spear of Kicked Piercing Death. The True Name is the same as when she is a Lancer. It takes the life away of the target. However, the process is different. This is the famous kicked Bolg, the one which makes all the warriors gaze in aw. One of the summer storms that grips a warrior's heart. Clear !Section 7 "Is There Anything You've Forgotten?"" Scáthach is the mentor to many warriors, but she does not consider her relationship with her Master to be one of "teacher and student." That should be the same when she manifests as an Assassin, but she will sometimes ask to go on runs and try to help train the Master. This is probably because she is more excited than she usually is. The queen of the foreign territory・haunted ground called "Land of Shadows" and mentor of warriors, Scathath--- or so should be. But, at this occasion, she carried out the reckless deed of changing herself and several other female Servants around into swimsuits - all under the guise of adapting to the environment. The result is this summer-style that you see. Scathath's own testimony is "it is fine to act like this sometimes". 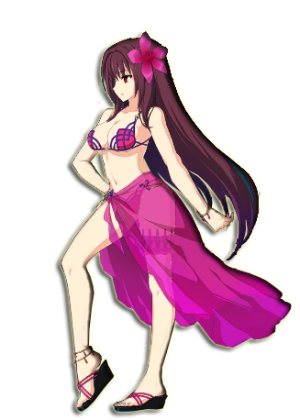 She is no different from the usual Scathath... or so we thought, but from the point she is adapting to the beach, her tension is actually sightly higher than normal. While there is no conspicuous change, one should be able to notice this if he observe with care. Unlike Beach Flower, even gazes that deviates from the domain of yearning are gathered. There is a risk that the beach will fall into chaos just by Scathath walking around. Such is the basic stance of Assassin Scathath. Even in regards to the Master, she seems to think that he should have fun while he can, but.. This is famous kicking Bolg, which made many warriors struck with admiration. Take it as summer squall that shoots dead the hearts of warriors. Scathath was the mentor of many warriors but, in regards to the Master, she is aware that "our relationship is not one of mentor and pupil". It should be the same even as she manifests as an Assassin, but she unconsciously ends up trying to train him while saying things such as "how about running around?". As expected... should we see this as her being more festive than usual? This page was last modified on 29 January 2019, at 08:40.